SANCTUM: Newest James Cameron Adventure at CES! While attending this year’s CES in Las Vegas yesterday, we had the special treat of viewing a full movie trailer along with movie clips (totaling 12 minutes) of a new 3D film executive produced by James Cameron, called Sanctum inside of an actual semi-truck trailer (more on that later). Sanctum is a cave dwelling adventure, and water submerged experience. Based on a true story from the film’s writer producer Andrew Wight, the movie is about the collapse of a cave’s entrance while fifteen people were inside exploring the underneath structure in waters trapping them deep underground. Wight was the real-life expeditor of the exploration and Australian dive adventure depicted in the film. He himself is an underwater explorer and filmmaker. He joined Cameron’s team at “Earthship Productions” which focuses on films about ocean exploration and conservation in 2001. Wight’s credits include: Ghosts of the Abyss, Last Mysteries of the Titanic, and Aliens of the Deep. Sanctum, directed by Alister Grierson (Kokoda), appears to be yet another engaging and immersive water film. The film’s trailer describes it as a “physiological thriller”. In the 3D video introduction by movie’s executive producer, James Cameron, he explains that at the heart of the movie, it’s an “emotional journey of an estranged father and son” as they explore the mysterious world of diving. Cameron also stated that the intention of the story was to “play it very plausible and make it a psychological story of the survival” in the exotic surroundings such as a cave. According to Cameron, the film was entirely shot in native 3D and “much” of the same technology and equipment that they used to make Avatar, they also used in this film. Unfortunately, I did notice that the film is not an IMAX movie. Just as Tron: Legacy chose to use a low-light set to film in to enhance the 3D experience, the filmmakers of Sanctum used the film’s environment of a cave to enhance it’s 3D. Cameron stated, “3D always works better when the subject is closer”. We instinctively knew that the cave environment and 3D would be a perfect fit to thrill an audience”. But, also what better fit to present a cave and water film than inside of a similar environment? That environment being a semi-truck trailer! A 65ft x 32ft trailer was rigged-up with 91 stadium style seats, a 3D HD digital projector, digital surround sound, concession stand (yes, we had popcorn!) and wrapped with the film’s art-work awaits curious viewers in the vast parking lot at this year’s CES to present this new jewel of a 3D adventure. The company that creates these mobile theaters is called Cinetransformer, and they will be making the tour rounds screening Sanctum movie clips and teaser across the country from now until February 6th where it will wrap at Universal Orlando. 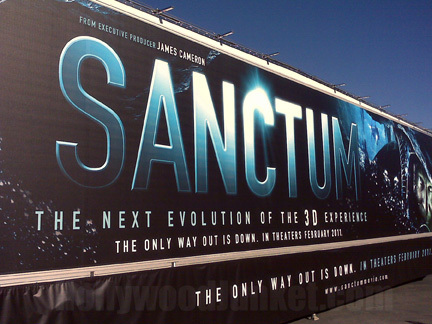 Look for Sanctum opening in theaters on Friday, February 4, 2011.